Preheat your oven to 375 degrees F. Make sure the artichokes are as dry as possible - be careful not to squeeze them when drying, because the artichoke heart will detach form the leaves. Combine your panko, parmesan, salt & pepper. Dip the artichoke in the egg then the panko mixture. Place them on a non-stick pan and bake in the oven. While the artichokes are baking make your aioli. Scoop a couple generous spoonfuls of the olive oil mayo into a bowl. Zest and juice a 1/4 lemon and add two teaspoons of white truffle oil. Mix, taste, and make changes if necessary. Remove the artichokes after 20-25 minutes or until they're golden brown. 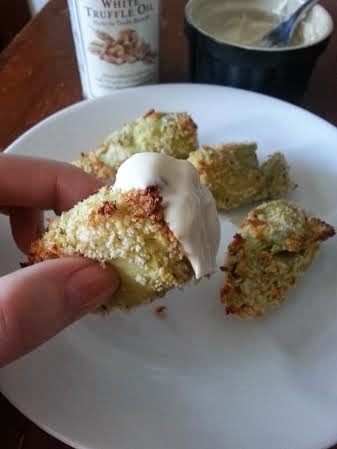 What flavor aioli would you make to dip in the artichokes?